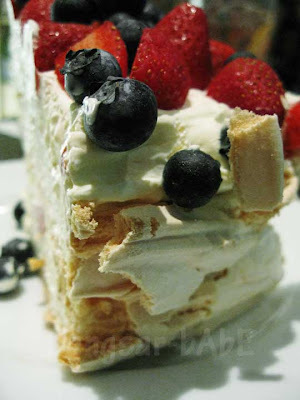 I decided I wanted cake instead of drinks last week, so Alexis it was, for some Pavlova. I know it says meringue on the display, but it looks like Pavlova to me. So, I’m going to call it Pavlova. 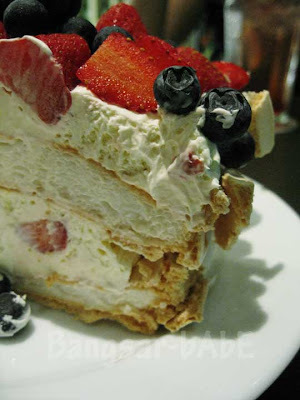 Between gossips and catching up, we happily dug into the lip-smacking combination of delicate, crispy outer shell, soft, marshmallow-like centre, fresh cream and fresh fruits. The fruits were tangy and some very tart (especially the blueberries), so the Pavlova wasn’t too sweet. Although it was delicious, I still prefer the Tiramisu. They are both very good, just a matter of preference, really. As a food blogger, friends and family often leave it to me to decide on where to eat, which I enjoy doing. When friends ask me for restaurant recommendations, I’m more than happy to help. Please…just dial 103 for TM Directory, I REPEAT 103, one-zero-three, satu-kosong-tiga….state the name of the restaurant/place and the operator will give you the number! I don’t keep all restaurant phone numbers in my cell and neither am I glued to my monitor 24/7, so calling me and expecting me to give you the number ASAP is ridiculous. And how can you expect me to stop what I’m doing (like my job! ), go on Google and find the number for you? So there! I’m giving you the number….103! Call this number next time. I need fire extinguisher… someone's on fire!!! cool down… don't let your emotion to ruin your day ok?? Yeah I agree that sometimes people do take us for granted. Believe me, some of my friends are also like this… but I always kept my cool and replied "Sorry wor… I don't have the number with me. If you want, there's always 103 you can call"
y is tat experience all sounding so familiar..
its the expectation isnt? i just have to bluntly answer that go google n find yourself..
apparently (no surprise) from watching AFC, the meringue is the egg white (the raw mat) and the pavlova is the finished product..tats wat i remembered from the show hehe..
Hmm… i also can't stand ppl like tat – so demanding & take-for-granted, like we owe it to them, hoh! i agree with u . we are not a walking directory for them to ask . like we don't have other things to do ryt . some ppl always take granted on other ppl . hahaha, i agree with you. i am having this trouble as well. we are not the restaurant-'dictionary' or something, they should have go google or press the phone directory or look for yellow page! Alexis' cakes are pretty good. 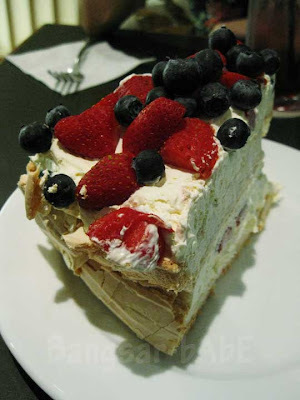 My first taste of pavlova was at Alexis many many years ago! jeen – Seems like they mislabeled it everywhere…it says "meringue" at BSC too! LL – Yes they are…yum yum yum! Raynebow – Once or twice then I won't be pissed off la…but some have been doing this for a long time. My bubble burst already! Simon – Yup…I think they're just plain lazy! Chong – Guess I have to be firmer next time, or I'll just give them 103 to call! And yeah..the Pav is good! not too sweet! very fresh cream and fruits too. I liked it! The first time i had Pav was at The Apartment. Swore off Pavs aft that. Now I wanna try FBB's..wanna share? Haven't tried the meringue/pavlova before in Alexis before. But do have to say that their tiramisu is the best I've eaten so far! Love it. wah … erm let's say I'm lost in KL somedays when I'm there, can I ask you ah? Agree with you, nothing, and I repeat NOTHING, beats the TIRAMISU cake at Alexis. 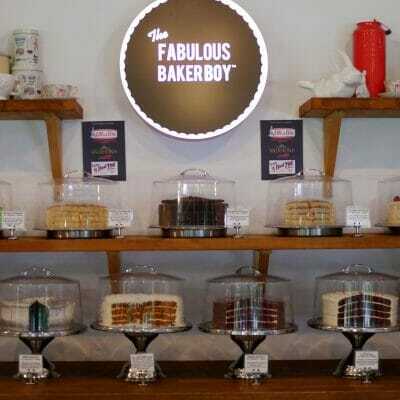 I've never tasted anything like it, and they (or rather the person who bakes it) have mantained the quality and consistency since oh, so many years ago (when Alexis was only in Jln Telawi). Also, just would like to express my appreciation to you for running this blog, taking your time to put up pictures and your comments on the good food guide in Malaysia. Don't let those obnoxious and ungrateful people get you down. had that cake for a birthday. loved the frootiness. Cumi & Ciki – Can go petition for name change de! 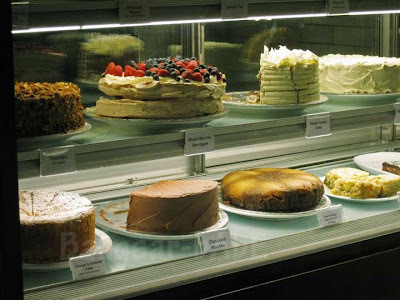 Sugar Bean – The pav is quite good. Not my favourite, but at least I've tried it!